It's Wednesday, so that means it's time for another edition of Daily Turismo's better than a Ford GT-40 flying buttress C-pillar game also known as Mid Week Match-Up! Exactly 61 years ago today, (January 14th, 1954) the Hudson Motor Car Company merged with Nash-Kelvinator Corporation to form the American Motors Corporation....which means its time to dust off your searching fingers and find the best AMC product for sale on the interwebs. 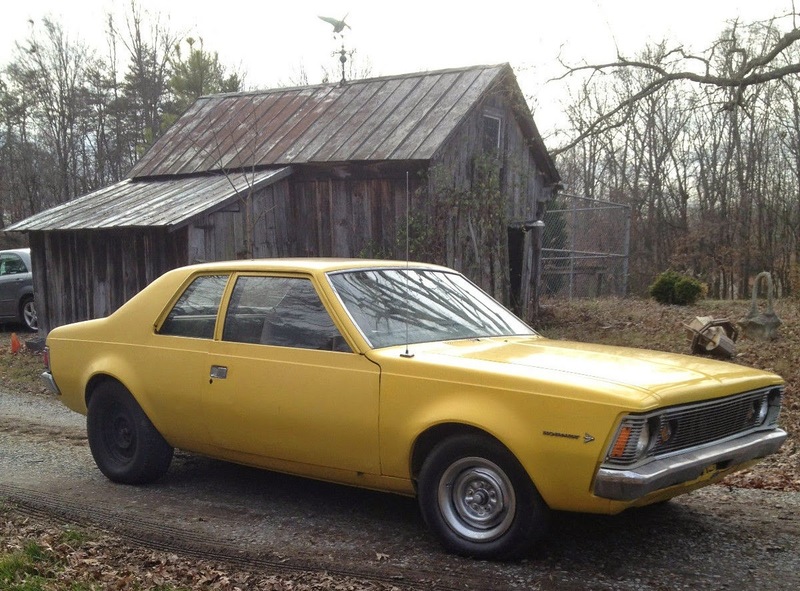 My pick is this 1971 AMC Hornet currently bidding for $898 here on eBay with a few hours to go, located in Fredericksburg, VA. THe Hornet was a simple answer to the complex automotive question and this one has the 304 cubic inch (5.0 liter) V8 mated to an automatic transmission. Its just a few weekends away from being turned into a Hornet SC/360 clone and Hornets are all but gone from the road today. What would you pick? (P.S.-- Any chance of getting an "add link" button to automatically code links? Pleaaaase? I think it's hilarious that the color is listed as "trans am red." Wow, someone made a time capsule out of a Pacer..... what universe did I just land in? 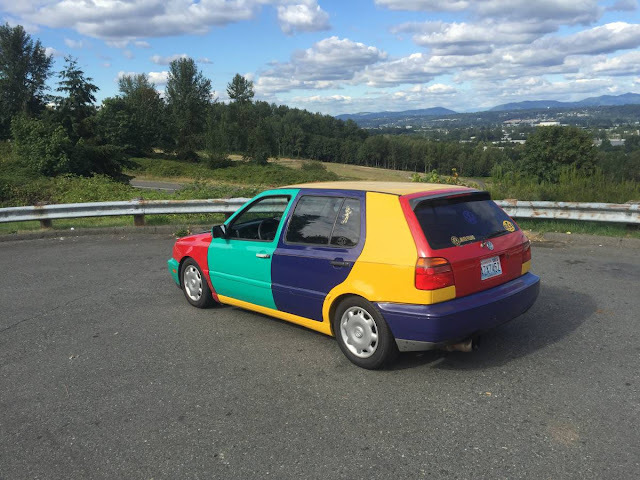 Just think of the chicks you could pick-up with that sweet ride! "Yeah Baby, I bought it for the styling AND handling..." Sweet! I would choose any of these, budget dependent. If I were rich, I'd go for the Rambler or either of the AMXs. If I were looking for a cheaper AMC, I'd go for the 69 Javelin with 34K miles. And it would be awesome if we could use the IMG tag, too. Awesome! The Rock is looking too thin. He's getting that skinny body/big head thing going. Anybody seen "Hercules" yet? I will make a note on the front page, but the [img] tag is now functional. Eagle Sundancer 4x4. Only 211 made and this example has only 27K on the clock. So cool you can only use CAPS in your ad. Or the Sundancer's staid older sibling, the 4 door Eagle from 1986 for only $1100. That said, the underbite on this '61 Rambler Ambassador does appeal. This would be an interesting choice, too. Yeah, I like that Alliance. I think it is GTA. Looks perfecet. Quite nice cars to drive. I tried to delete my comment about the img tag and make it more clear, but somehow my comment got merged with Zach's comment on the 4door eagle. I take FULL responsibility....and have zero idea how that happened. Seems to have killed my Sundancer 4x4 find comment too. I love that thing - it's been for sale for a VERY long time. STOP STEALING MY COMMENTS VINCE! Image tags not working properly on mobile. I dont see any AMCs that jump out at me, but in a related matter who can name two automobile manufacturers who started out as refrigerator manufacturers? Nash did too, I believe. Shoot. I keep thinking of more...International Harvester, Studebaker, Kaiser...I wouldn't be surprised if GM could be connected to fridge manufacturing, too. The featured 71 Hornet looks okay. The car, however, and its surroundings in the photos, remind me a lot of '80s episodes of Unsolved Mysteries. I don't know why AMC didn't just market a "serial killer" appearance package on some of their vehicles. Mustard yellow. Missing hubcap. Mis-matched tires (you know, just to give the investigators a little something to go on). Probably would have sold a few. Be nice to see that outside after a car wash ! @K2 That AMX is crazy needs 10K to fix paint and body the Javelin a Muscle car with a 232 come on ! I prefer the 68-69 AMX over the later ones ! JB1025, you're right. A 232 145 hp I-6 does not a "Muscle Car" make, "Unique" or otherwise. Somebody went a little overboard with the writeup. I suppose they should have written "Muscle Car Looks" and focused on the low miles and condition. That all being said, there can't be too many of the 40,000 or so produced left and the I-6 did get pretty good mileage. Was not ragging on you just the AD and that AMX was about 20k high you should be able to find a super nice one for the money there asking. AMC is one of the cheap ways to get a muscle car. Fastest car wash in town ! The Hornet for sure! So much potential!